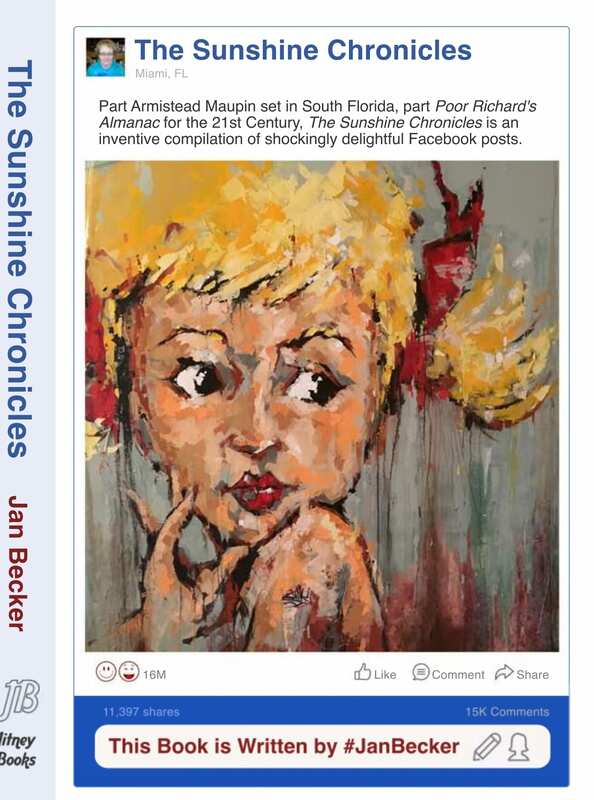 The Sunshine Chronicles is an inventive compilation of Facebook posts by local writer and professor, Jan Becker. Shockingly delightful, and unflinching in their candor, the posts reveal an intimate portrait of a quirky writer and her South Florida surroundings. Readers will simultaneously LOL and find themselves deeply moved as Becker navigates domestic life with The Chef and Feline amidst a zany cast of neighbors and characters. From Creepy Maintenance Men with tawdry agendas, and annual invasions from snowbirds like The Winemaker and Grandma, to struggling through the summer with no AC in the car, The Sunshine Chronicles is a unique glimpse of both a small slice of Florida, and one woman's outlook on the world-at-large. You will "like" this book. The Sunshine Chronicles is an inventive compilation of Facebook posts by local writer and professor, Jan Becker. Shockingly delightful, and unflinching in their candor, the posts reveal an intimate portrait of a quirky writer and her South Florida surroundings. Readers will simultaneously LOL and find themselves deeply moved as Becker navigates domestic life with The Chef and Feline amidst a zany cast of neighbors and characters. From Creepy Maintenance Men with tawdry agendas, and annual invasions from snowbirds like The Winemaker and Grandma, to struggling through the summer with no AC in the car, The Sunshine Chronicles is a unique glimpse of both a small slice of Florida, and one woman’s outlook on the world-at-large. You will “like” this book.